I discovered this a few weeks ago, when I wrote this list of the six coolest unreliable cars you can get from CarMax. It was fun to write, and it was fun to read, and we all had a great time perusing the list, and checking out the cars, and laughing about the fact that you can get a bumper-to-bumper warranty on a used Mercedes with more power than Soviet Russia. But the list was supposed to include a seventh car. It was supposed to include a Range Rover. Before I explain why it didn't include a Range Rover, a little background for those of you who are joining us for the first time. Right away, I know what you're thinking: Everyone already KNOWS the background. But it turns out that isn't the case. Earlier this week, when I wrote a column about how expensive it can be to own a used luxury car, five or six commenters recommended that I "should get an extended warranty." 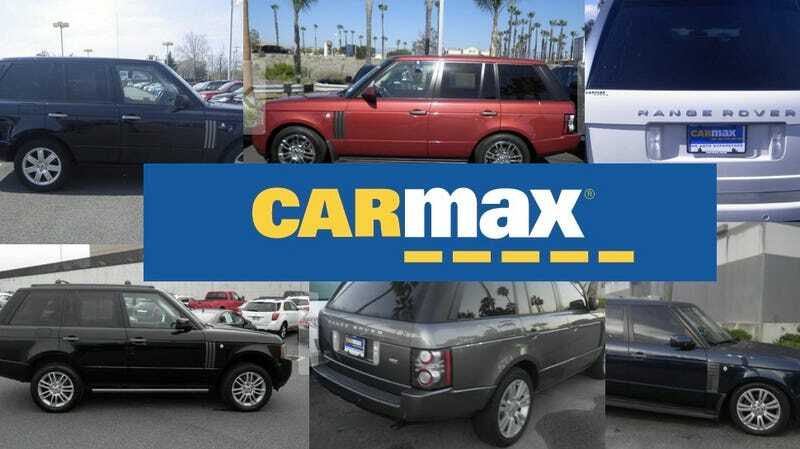 So anyway, a little background: about two years ago, I bought a 6-year-old Range Rover from used car retailer CarMax, the world's largest consumer of blue polo shirts. I also paid $3,899 extra for a bumper-to-bumper warranty, which included 6 years or 67,000 miles of coverage. I thought this was a good idea, considering that the latest JD Power reliability study ranks "Range Rover" slightly below "heroin addict." Well, what happened next was predictable: the Range Rover started breaking. And breaking. And breaking. And at last count, after less than one-third of the warranty period had passed, the Range Rover had already racked up more in expenses than the warranty had cost to buy. Of course, every time the Range Rover has broken down, I've posted about it here on Jalopnik – and the columns always receive a warm reception, and positive comments, and a lot of views. So I'm writing the "six best unreliable cars" piece a few weeks ago, and I decide to include a 2008 Range Rover with 52,000 miles – about the same figure my car had when I bought it two years ago. This is perfect, I think: it's the same age as mine was! It has the same miles! It looks the same! I'll post it up and talk about how you, too, can buy a used Range Rover with a cheap warranty and drive around worry-free for the next few years! Except that isn't quite what happened. Instead, what happened is that I called up CarMax of Random American Suburb, and I spoke to a guy named Roger, or possibly a woman named Sheila, I have absolutely no idea, and I asked for a warranty quote on this 2008 Range Rover. So Sheila/Roger went into the CarMax computer system, and typed in all the particulars, and the warranty quote came back: for the same warranty that cost me $3,899 just two years ago, CarMax is now charging $8,299. Eight thousand. Two hundred. Ninety-nine. In other words: the jig is up! CarMax is hip to our scheme! The days of cheap warranties on breakdown-prone Range Rovers are officially over, and wannabe Land Rover owners must now go somewhere else to drive around, worry-free, in one of the most capable SUVs on the planet. Such as the Toyota dealer. The good news is that there's still a wide range of other CarMax cars you can still get with the good ol' bumper-to-bumper warranty. V12 BMWs. Eight-year-old AMGs and "M" cars. High-performance Porsches and Audis. Expensive luxury sedans with motorized rear-seat tray tables. They're all still available, still for sale, still offered with the warranty for just a few thousand dollars extra. But if you want a used Range Rover, the dream is dead. Gone. Buried. Kaput. Unless, of course, you want to spend an extra eight grand just to drive around for the next few years without any anxiety. I wouldn't do it, personally. But I'd respect you if you did. And I think you'd still end up breaking even.